Premium Steak & Wine Novotel Gangnam's "The Bistro"
Australia Beef: The True Taste of Steak at Novotel Gangnam's "The Bistro"
With year-end parties becoming everybody's concern, steak is still the favorite choice of party hosts. The premium quality of Australian beef has recently been widely acknowledged by steak lovers and especially, with hygiene issue of American beef, the Australian beef is becoming spotlighted. The bistro of Novotel Ambassador Gangnam features the very best taste of Australian premium steak combined with the equal quality of wine. 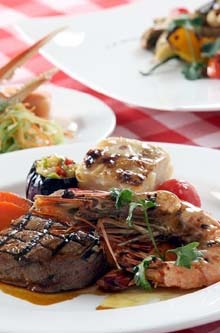 The special features, available through the end of year, include main dishes such as Grilled Australian Rib eye steak, Grilled Australian Sirloin steak and Grilled Tenderloin and a King Prawn. Also, Jumbo choice is available with Jumbo Rib Eye, Jumbo Tenderloin and more. A selection of fine sauces (Mushroom, Pepper, Red wine or Lemon Butter) are served with main dishes. The special steak dining isn't only about dining. We care about your diet with a wide variety of salad choices including Salad of rocket with sliced mushrooms, Baked pumpkin and assorted mushrooms with garlic clove, onion, spinach & tomato quiche and other fresh seasonal salad with dressings of your choice. The steak menu comes with complimentary draft beer and Australian wine (Bilyara Shiraz & Bilyara Chardonnay) to complete your dining experience. Following the main dish will be desserts featuring Chocolate mousse and cake without flour, Raspberry sherbet, Orange Cream Brule, poached peaches, vanilla ice cream, chocolate crumble and a lot more.